The global retail ‘Juggernaut’ Amazon has finally received a patent for its on-demand 3D printing retail service which will help the company to manufacture and supply orders for 3D printed products. The idea which was floated in 2014 seems to have come a full circle with this patent. Amazon now aims to revolutionize the retail industry (again). Amazon had launched its 3D printing store back in 2014 where people could order 3D printed products. These products ranged from toys, home accessories & jewelry, but these were manufactured by their partners like Sculpteo, 3DLT, and Mixee. It also offered 3D printing hardware, supplies, and other accessories and it still sells those. Such online 3D printing services are already existent and players like Shapeways are performing extremely well in this made-to-order business. But Amazon has gone a step further, like it always does, and brought true meaning to the On-Demand manufacturing. While Shapeways is more focused toward the industrial and the creative aspect of the 3D printing service, Amazon will cater directly to the need of the hour. With its dense and acclaimed delivery potential, it can have a huge impact on this innovative service. 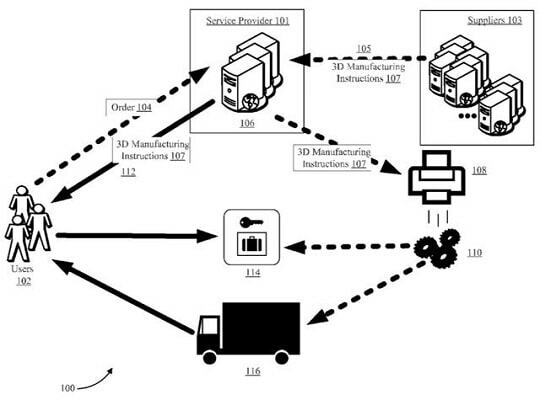 Amazon recently was awarded a patent for its innovative on-demand retail service specifically for 3D printing. This idea was floated back in 2013 but somehow it didn’t garner that much attention. Amazon explained how the retailing service will work. For example, if a critical element of an everyday household durable breaks down the customer can easily log onto Amazon and place his order for the specific part. Amazon would then search for the CAD file of that specific replacement part in its online digital library. This part would then be printed, it can be printed either through a third party partner or at the Amazon warehouse or the 3D printing setup can even be mobile on a truck which itself can deliver the product to the customer. With this service, the customers can get their designs 3D printed from Amazon and get it delivered to them right at their doorstep. This patent will not only benefit Amazon but also bring true On-Demand manufacturing to every customer’s doorstep.